White Christmas Cookies are only 7 ingredients including instant White Chocolate Pudding. They are buttery sweet with a slight hint of salt. They MELT in your mouth! 1. Preheat the oven to 350°F. Line a baking sheet with a Silpat Non-Stick Baking Mat or parchment paper. 2. Cream together the butter and sugar in a large mixing bowl until light and fluffy, about 3 minutes. 3. Add in flour and instant pudding and mix until combined. 4. 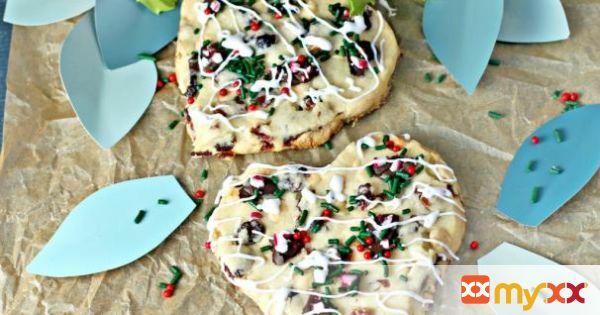 Fold in white chocolate chips, dried cranberries and pecans. 5. Roll cookies into about a 1½" ball and place onto baking sheet about 2 inches apart. Lightly press down on cookies to slightly flatten (or if you want to cut them out using cookie cutters; on a lightly floured surface roll out the dough into a ¼ inch (.6 cm) thick circle. Cut into rounds or other shapes using a lightly floured cookie cutter. Place on the prepared baking sheets and place in the refrigerator for about 15 minutes. This will firm up the dough so the cookies will maintain their shape when baked). 6. Bake at 350°F for 10-15 minutes or until the cookies start to slightly brown around the edges. 7. Allow to cool on baking sheet for 5 minutes before moving to cooling rack.